Arctic Cat ATV Prices - Latest Prices for All Models. 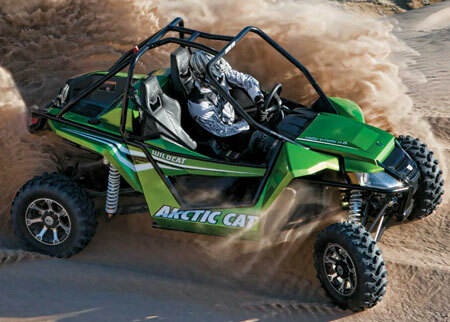 The Arctic Cat Wildcat is big news this year! These Arctic Cat ATV prices for 2012 are a quick reference guide of the suggested retail prices of new models. Since the 2012 models have been introduced, these prices may be reduced by the dealers. We suggest calling several ATV dealers in your area to check for any "special" deals they may be offering. Download brochure for Arctic Cat ATV Prices with more info about each model. All the Arctic Cat ATV Prices above are the latest Manufacturer's Suggested Retail Price (MSRP) for each model listed. Most Arctic Cat dealers will offer some sort of discount or "deal", so be sure to check with a few local dealers before you buy. Prices are up for almost all models this year, so bargain hunters will be disappointed. If you are looking for a better deal, be sure to check around for any left over models from previous years. Dealers are usually much more willing to discount these ATVs to make room for the new four wheelers. Arctic Cat has streamlined their line up and expanded the selection for some of the more popular models like the MudPros and two up models. There are basically only two option packages this year - the GT and LTD designations. GT Package for ATVs - Includes aluminum wheels, automotive style paint, and electric power steering. LTD Package - Comes with everything in the GT option, and adds a winch and heavy duty bumpers. The i designation - Any Arctic Cat ATV models with the little i means they come with electronic fuel injection standard. The Arctic Cat Wildcat created quite a buzz this year. Follow the link for our full review of this radcal new Arctic Cat sport side by side. So that's all we know right now about Arctic Cat ATV Prices. If there are any changes or additions with mid-year model introductions, we'll post it here first. Be sure to check back often. ATV Prices - Guide to prices for all makes and models of ATVs. Arctic Cat ATV - Guide to Arctic Cat models with tests, reviews, and more.